They say that the only certainties are death and taxes and we are not going to disagree with that in the least. The truth is that everyone dies and everyone will at some point need funeral services. Traditionally there have been very few options as funerals were largely ritualistic and prescribed. This meant that it was much less common for your personality (if you are pre-planning) or your recently departed loved-one’s personality to shine through at what is truly the last opportunity to influence the way you are remembered. Although many people are still opting for the traditions of their parents and grandparents in their funeral choices, many more are breaking out of the mold and making choices that are fun, whimsical and sometimes even shocking. Cemeteries can be beautiful places, filled with monuments and interesting historical facts. A bit like a museum, which is why it should come as no surprise that the next big thing is bringing museum technology into the cemetery. 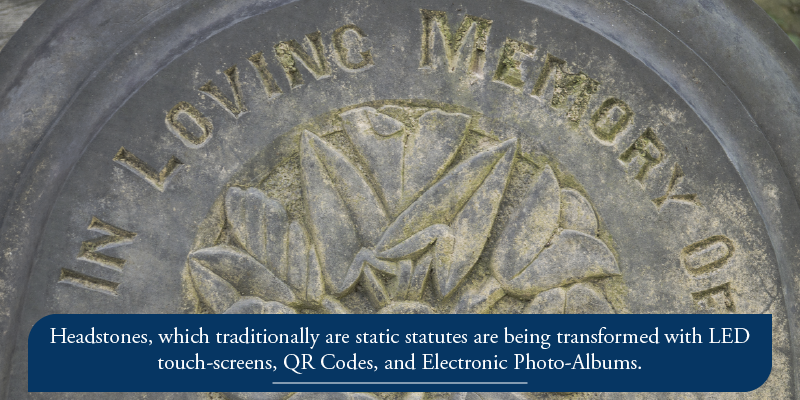 Headstones, which traditionally are static statutes are being transformed with LED touch-screens, QR Codes, and Electronic Photo-Albums. Several companies have begun production and the alternatives and availability are currently somewhat limited, but like all technology it should not take long for things that we cannot currently conceive to begin popping up on new graves and retrofitting old ones. This trend is more widely taking off in Europe than in the US, but it will not be long before video, photo, and audio content is widely available in weather-proof, vandal proof, memorials. Already QR codes that are specifically made for cemeteries are widely available, which when scanned lead to websites that can be highly advanced, or simply elegant. Our guess is that within a decade the technology geniuses will figure out how to integrate holograms that are triggered when a motion detector implanted with facial recognition software is triggered. It is 2018 and families live further apart. And thanks to globalization and the rise of social media more people are connected with many others in several places. This makes attending funerals more complicated than they were a generation ago. Combine this with the modern-day headaches of airline travel, and getting home or getting to a funeral isn’t always so easy. Enter the solution of the web-cast funeral. Now before dismissing the concept as odd, or less personal or intimate, remember that more low tech versions of this have been happening for as long as the television has graced family rooms. Going back to the days of JFK, families gathered and participated remotely. The difference here is that with webcasting you are not just an observer, but you are interacting as well. Webcasting funerals can be done on a small scale for just close friends and family, or they can be done on a large and public scale, truly making celebrating life and memorializing death accessible to anyone anywhere at any time. From custom cremation urns that are designed in any shape and color, fit for internment or fit for your mantle to having your remains turned into fireworks, there are literally endless alternatives for what your remains can become. 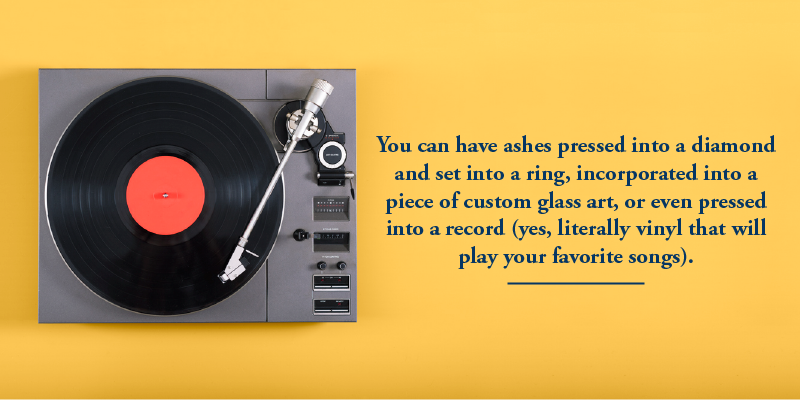 You can have ashes pressed into a diamond and set into a ring, incorporated into a piece of custom glass art, or even pressed into a record (yes, literally vinyl that will play your favorite songs). It would seem that there is no lack of opportunities that can be brought into your memorial with your cremated remains as long as you can find an artist or a company that is willing and able to design and develop your dreams. So go tacky, beautiful, humorous, or refined, but if cremation is your direction just know that you can go with it. In 2013 TLC aired a show on The Best Funerals Ever that sparked a trend that has grown ever since. From Star Wars to Christmas, color palettes to sports teams, people are now designing funerals to play out fantasies or hobbies. More often than not these funerals involve dressing or costuming and decorations that make them more interesting, and even fun, than the traditional service. And funeral directors are catching up and offering more options to help the families and friends celebrate the life of their loved one. People are starting to move their funerals away from the traditional funeral parlors to barns, bars and even back into their homes. These alternatives provide individualization that make them more special and a memorial appropriate to people who prefer to remember their loved ones where he or she enjoyed being. Still others are embracing the idea of destination funerals at beaches, resorts and other vacation spots, which is growing in popularity. 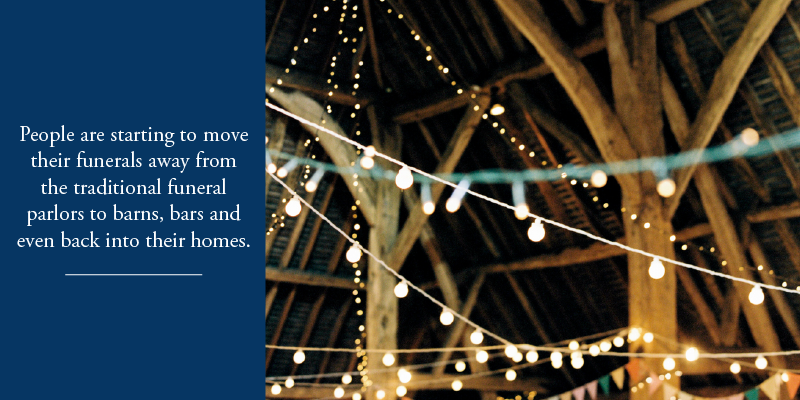 However, if people have to travel for a funeral, why not treat them to something a little bit different? The opportunities today are as endless as your imagination (within the confines of the laws of your state). So if it is important to you to carry your own personality into death, or to make sure your loved one is honored, then before moving forward with any of these ideas or designing your own, consult with an advisor, such as those at CMS Mid Atlantic [or do we want to list a specific cemetery? ], who can help you plan ahead. And remember, even though death may be inevitable – the way you are remembered and memorialized doesn’t have to be. This entry was posted in Uncategorized and tagged Trends in Funerals. Bookmark the permalink.